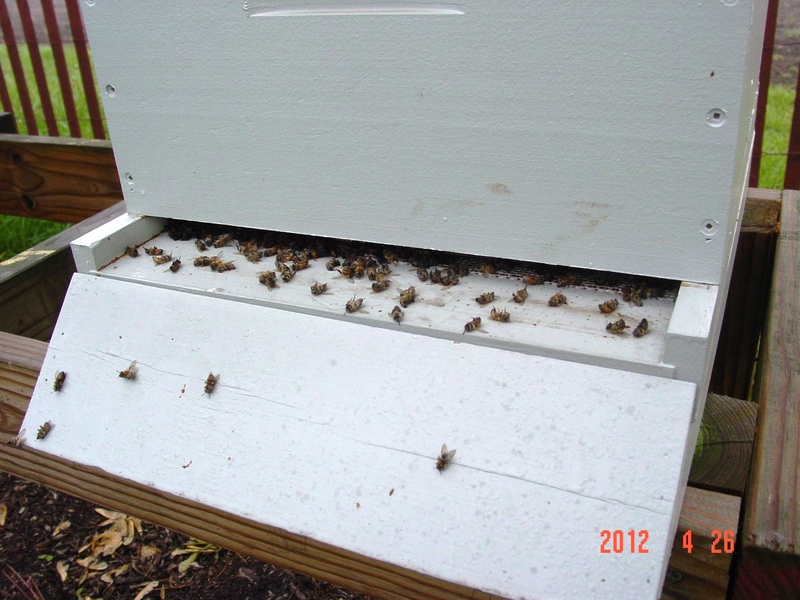 Last week there were some disturbing events that unfolded here at my home hive site. On Tuesday, Wednesday, and Thursday I awoke to large quantities of dead bees on the bottom boards of all three hives. This was particularly disturbing since two of them have up to this point been among my strongest hives. I don’t know what to think for sure. I have not been off of work on a good bee day to open the hives. I need a good day to diagnose anything that may be happening internally. I do know that there has been heavy activity in the fields around here. The wind has been very strong and I was told that some farmers were spraying. I have no idea what, or if it is even connected. 4/23 – High-59F Low-37F Winds Ranging from 9-28 m.p.h. during daylight hours. 4/24 – High-64F Low-32F Winds Ranging from “Calm” to 18 m.p.h. during daylight hours. 4/25 – High-70F Low-48F Winds Ranging from “Calm to 8 m.p.h. during daylight hours. 4/26 – High-70F Low-54F Winds Ranging from “Calm” to 21 m.p.h. during daylight hours. All weather data was from HAMweather.com — under the History section for 47353. I am trying to keep an open mind. Perhaps I have a disease problem? There was a small amount of spotting on the front of my bottom boards. Could chemical exposure cause that? With the lows we have been having perhaps they chilled. The fact is I don’t know. At this point I have too many questions and not enough answers. If I knew they were being exposed to something I would move them. If they have a pest or disease problem that would be the wrong course of action. I need to find a lab that I can send dead bees to have them analyzed. I will be working on that this week. It is odd to me that since this video was shot it has been too wet for fieldwork. I have had no dead bee mornings since…..
What do you think it looks like? Please leave comments. This entry was posted in Bee Kills, Hive Reports, Posts, Uncategorized, What's going on.. and tagged bee, bee kill, beekeeping, dead bee, dead bees, Indiana beekepeing, Jason Bruns, natural beekeeping. Bookmark the permalink. Sudden losses like this are not disease related especially since they do not repeat, one thing that could happen is if it is cold enough the workers can’t remove the dead but this looks like to much dead for that.. I would suspect chems.. Adults wouldn’t get chilled inside the hive if they have enough stores. I have been seeing a number of dead drones getting tossed on the patio stone under my hives (only a few hives are doing this) but not masses of dead workers. It is discouraging. I wish there was something I could do, but I am at a loss at this point. I still haven’t gotten a lead on a lab yet. I didn’t want to use those bees as samples because they were all wet and I figured they would get all nasty prior to being tested. I have been watching for deaths, and have vials ready in the event this happens again. If it doesn’t get too windy today I will be in there. Work really has really been getting in the way on good bee days! I have seen death due to robbing in the past when I have had laggard hives getting pillaged. Normally I don’t have robbing problems even in weak hives during good flows. We have a lot of blooming right now. I normally only start seeing bad behavior like that later on in the summer when we get into a dearth. thanks for the link… “newhampSHA'” There always seems to be another Bee website out there that I haven’t been to. It never ceases to amaze me. It’s just about planting time in Indiana. Check out http://www.bee911.org for information on what to do if you suspect bee pesticide poisoning.